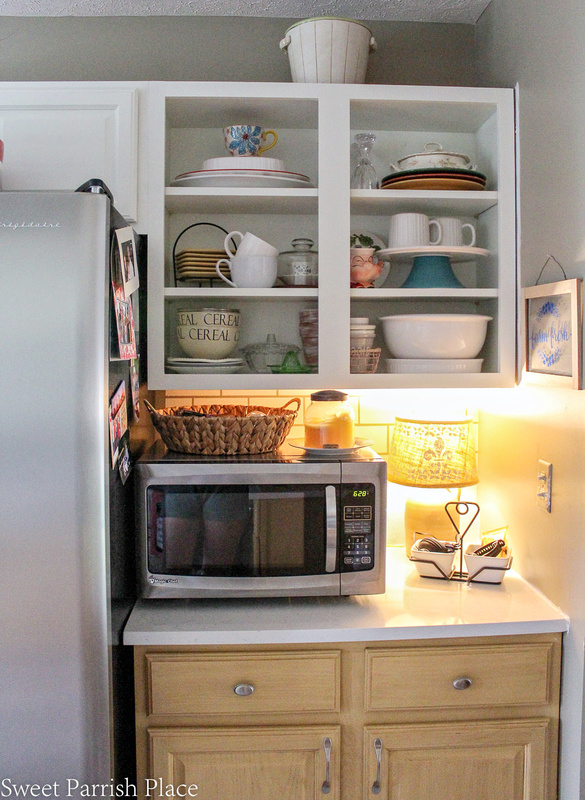 We have white painted upper cabinets just in time for week 3 of the One Room Challenge! Hey friends! 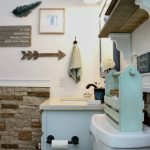 It’s week 3 of the fall One Room Challenge, and I’m sharing our progress on the kitchen makeover we are working on. 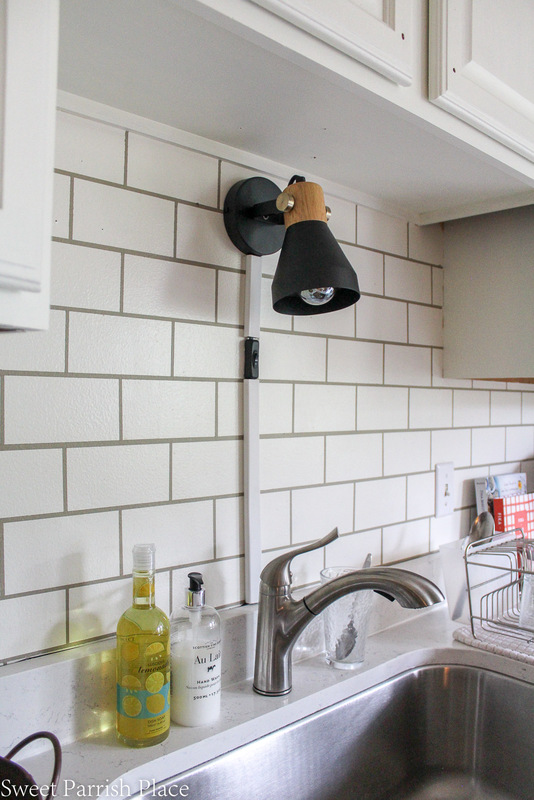 If this is your first time checking in on our kitchen makeover, you may want to start here: Week 1, Week 2. The first week, I shared our plans for this space. And week 2 is all about the lighting in our kitchen. 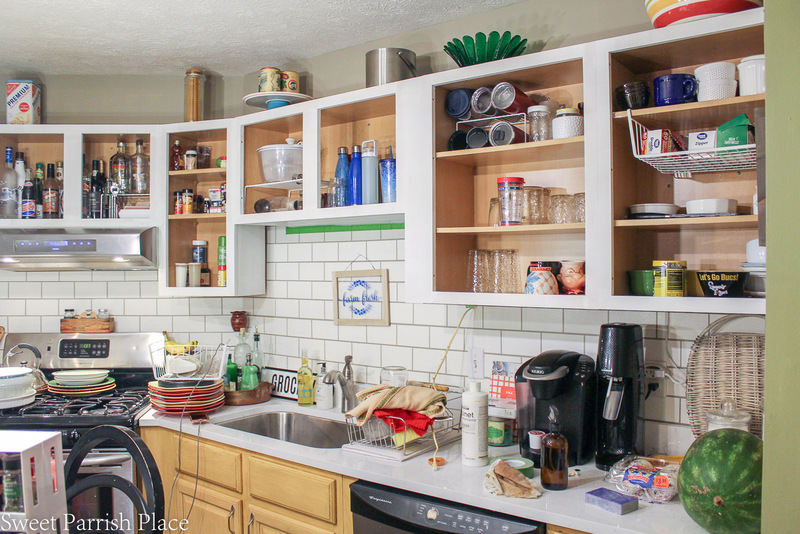 For week three I’m sharing our white painted upper cabinets. I’m only sharing a few photos today because I don’t want to give away too much before the big reveal. And remember, these photos are unstyled progress photos and some of the decor from the before kitchen is still pictured. 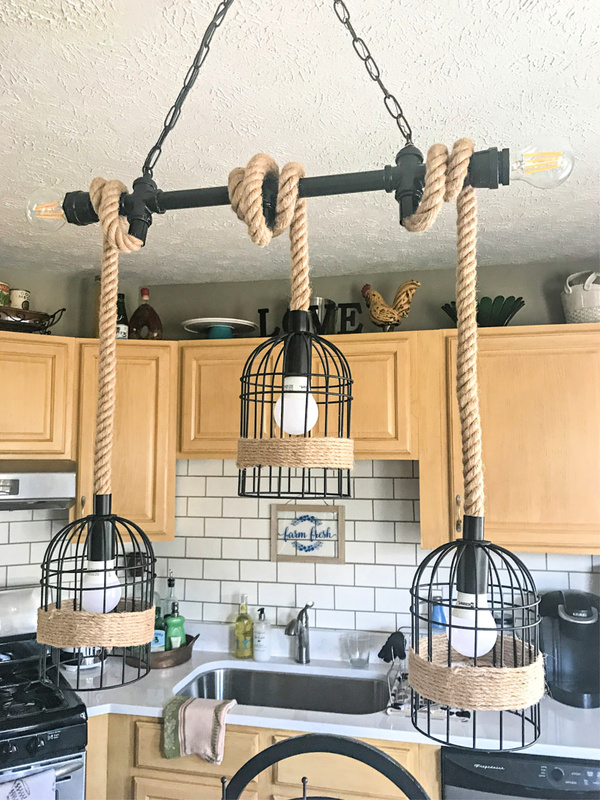 So when I left off last week, I had shared our new lighting over our kitchen island. For week 3 I am sharing the progress we are making with painting our kitchen cabinets. The upper cabinets are now complete, but in these photos, we don’t have the cabinet pulls attached yet. I will share what the cabinet and drawer pulls look like on the cabinets next week, but you guys, they are soooo good! 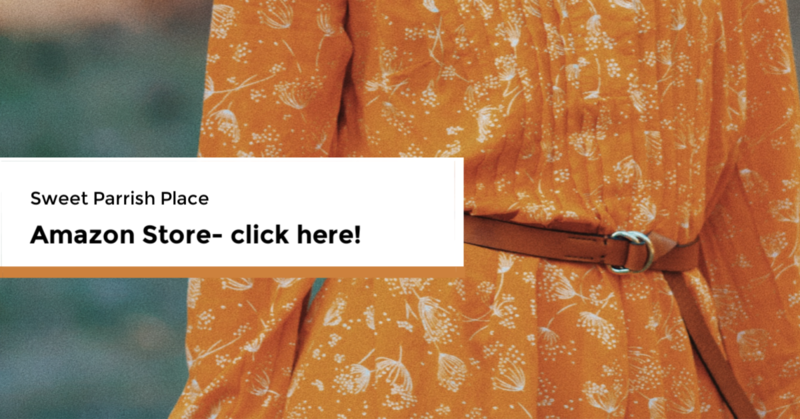 I partnered with Liberty Hardware on my cabinet and drawer pulls, and my new lovely outlet covers, and they were so generous and wonderful to work with, and I am very pleased with all of them. We chose these drawer pulls and this cabinet pull. Our next door neighbor is a professional painter, and I love being able to consult with him for advice, and I do so on a regular basis. I actually need to write a post on all of the great advice he has given me over the years because I just feel so privileged to be able to pick his brain on the regular. So obviously I consulted him about painting my kitchen cabinets. and I am so glad I did, because I honestly don’t think I would have done as good of a job without his advice. After the big reveal of our kitchen, I plan to do a full tutorial on painting kitchen cabinets, and I’ll give you guys all of the secrets I learned from my neighbor. Today I am just here to share our progress. If you look at the above photo, you can see the color of the bottom cabinets that I painted about 5-6 years ago. I used a Rustoleum Cabinet transformations kit to paint them, and they did not hold up very well. So I really wanted to get it right this time, because I want this paint to last for as long as we continue to live here. You can also see the rug I chose for this space, so you are getting a little sneaky peek right now. I am a color loving girl, and I love the colors in this rug. I can’t wait to see how it pops once all of the cabinets are white. 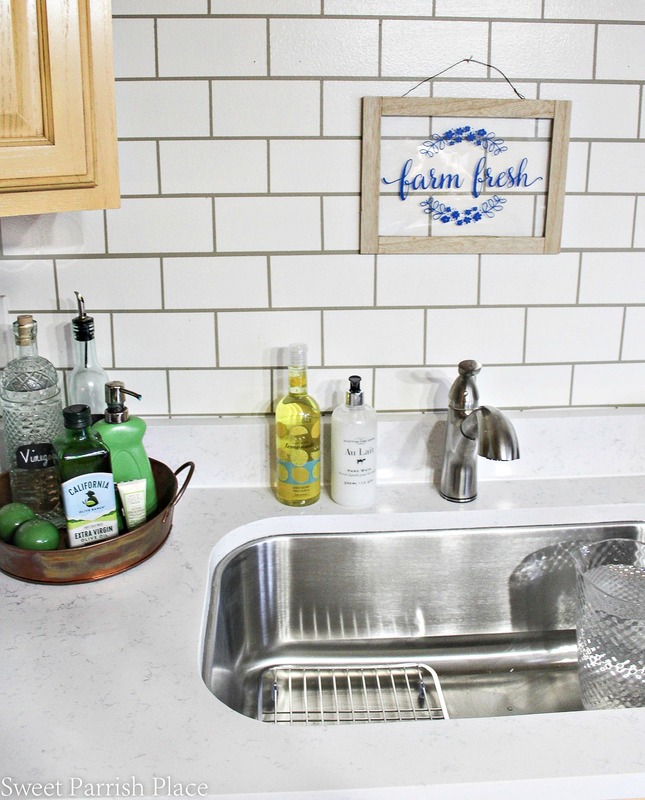 I received some products from Handy Paint Products to use for this kitchen makeover, and if you paint a lot and have never tried the Handy Paint Products, you should because they are so, well, handy! 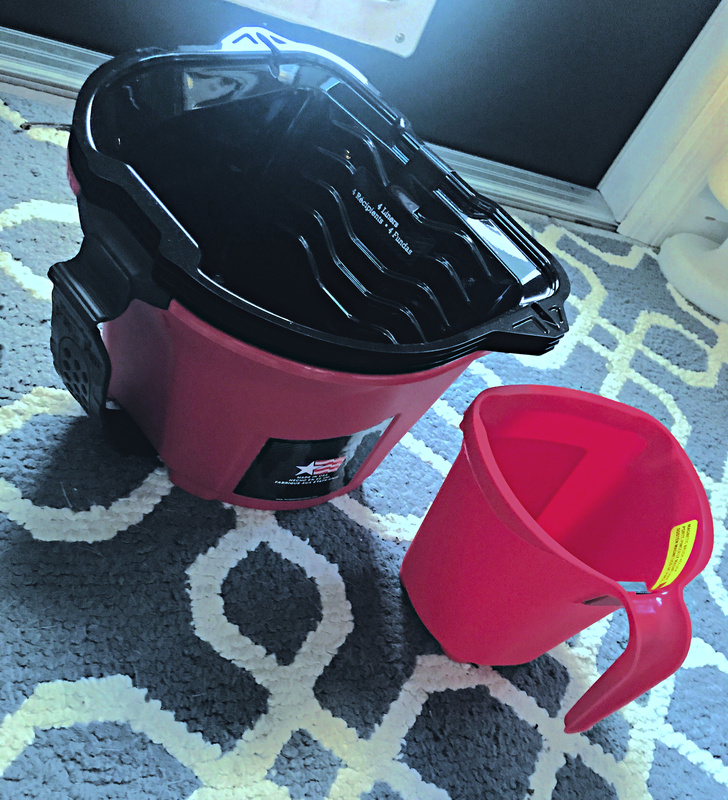 They make it easy to pour in the paint and carry it around with you, they have nifty liners that you can insert right into them for easy clean up, and I LOVE the paint pail you see to the left in the photo below because you can use it with a roller! It is the best! They also have a magnetic spot on them where you can keep your paint brush that comes in extremely handy. Last week, I also shared our other lighting choices for this room, and this wall sconce is the light we chose to hang over our sink. I purposefully bought a light that would plug into the wall because my husband wasn’t on board to hire an electrician to hard wire this light into the wall. But I needed the extra light, so this is a compromise. I purchased this kit to hide the cord from Amazon. I am aware that this would be unacceptable to some people, but it is fine with me, and in the future I may end up hiring someone to hard wire the light in, but for now, this works. I just simply covered the cord with this, and then I took a small command square to adhere the switch to the wall so it does not move. There was enough of a gap behind the counter top that I was able to shove the rest of the cord behind there, and then it just goes over to the left of this photo and plugs into the wall. In the big scheme of things, this little white strip really isn’t very noticeable, but I did want to show you my solution for hiding the stark black cord. I decided to just remove the cabinet doors from these two cabinets on the other side of the kitchen, next to the refrigerator and have some open shelving here. I painted all of the inside with the same paint. I did replace the shelving inside the cabinet area because the shelves were warped. So I bought some sturdy wood and had it cut down at Home Depot, and then I primed and painted them, and installed them in here. I styled them somewhat using things I already had around, but I plan to switch this whole area up before the big reveal. According to my to do list you see below, there is still a lot to be done in this room. But what you don’t see here is that I worked ahead a bit, so the entire cabinets are already complete. But I have to save that for the reveal! Next week, I’ll be sharing a few more sneak peeks of this room, and the new door and wall paint colors. 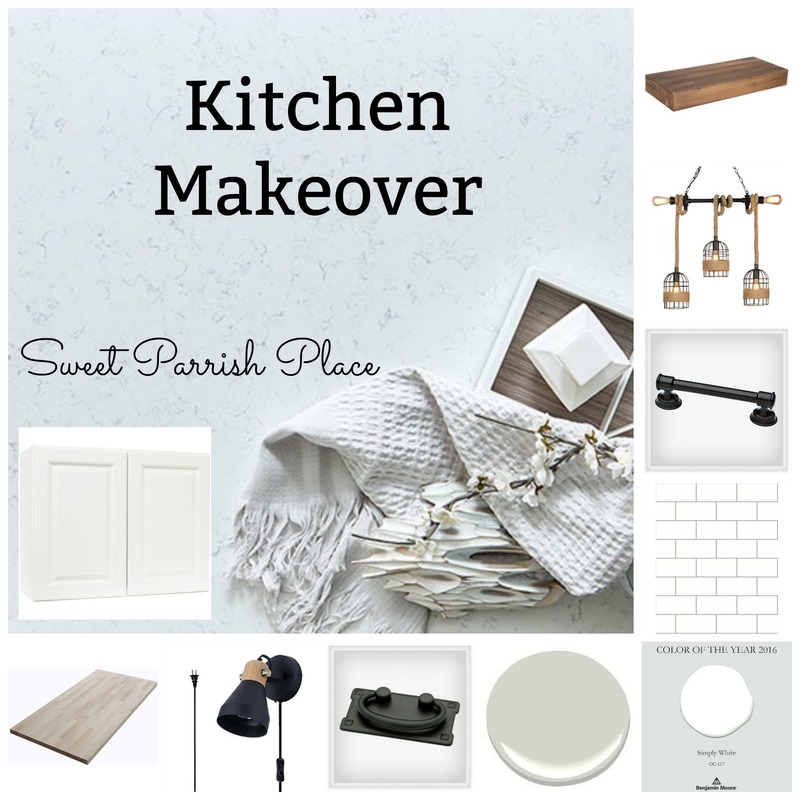 We are currently in the middle of a makeover on our kitchen island, and I am loving where it is headed. We are adding a wooden top to cover the current stainless steel top. And it is sooo good! So stay tuned for that! 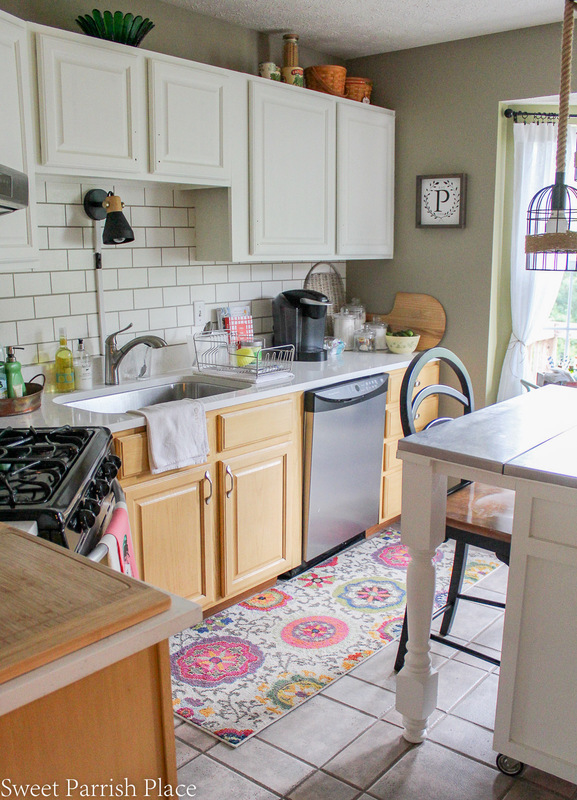 I’ll see you back here with another update on this kitchen makeover next week! Nicki I actually like the lighting kit you’ve installed! It’s a nice touch. As someone who has ZERO overhead j-boxes in all but 2 rooms of my home, I completely understand the compromise. This was a really good work-around. Looking forward to your final reveal! Thank you so much for the encouragement on that! That made me feel so much better! Love the HANDy Paint Products they are the best!!! You uppers look great too I bet that roller bucket was really handy for that project 🙂 Half way there keep up the good work!!! Jen, Me too, they are so handy! The roller bucket is fantastic, I love it so much!Thanks so much! Thanks so much Jessica! I am enjoying the open shelving so much! The white paint is looking good! I love open shelving in a kitchen. It’s so convenient. Thanks so much! I am happy with everything so far! Cabinets are looking great Nicki!